and behind the scenes. What new things are you most excited about? We completed our second year of frog and toad citizen science monitoring! Our volunteers heard six different species. See when we heard them and how it compares to last year (2017) in the chart. We heard more frequent calls in 2017 compared to 2018. For example, volunteers heard the American bullfrog 60 out of 92 (~65%) observations in 2017. In 2018 they only heard the bullfrog 4 times during the 41 (~10%) observations. 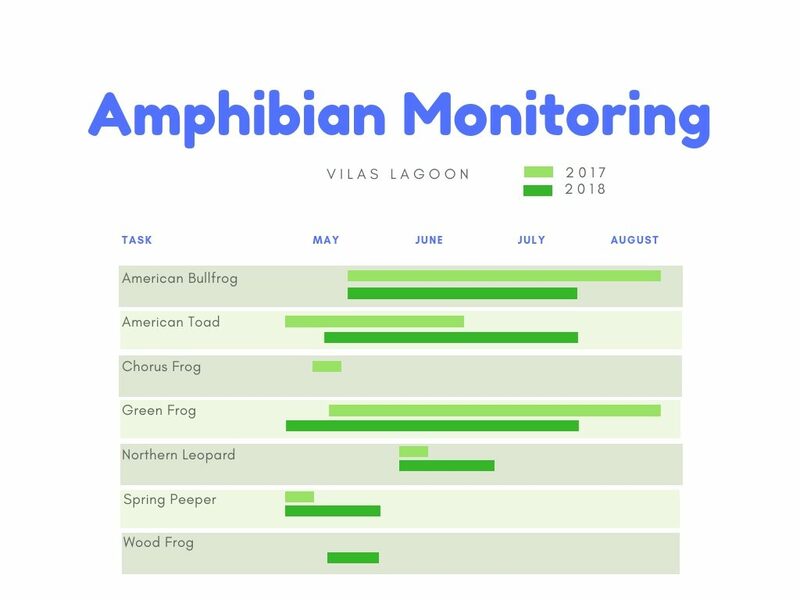 While several factors can influence the activity of a frog or toad, we think the main reason for lower activity in 2018 was due to the Vilas Bridge Reconstruction. We will see if the activity picks up again in 2019! Sommerfield, and Anja Wanner – we appreciate you so much! A grant for monarchs from the Wisconsin Natural Resource Foundation helped us to bring the life cycle of monarchs to classrooms that serve Wingra watershed residents this fall. One teacher said, “It was wonderful to watch 4Kers…They were THRILLED. Even during conferences in late November, family members were still sharing their child’s excitement about raising and freeing butterflies…” The grant had a large, measurable impact on students (left). We had two new developments this year. To minimize releasing infected monarchs, Karen Oberhauser, Director of the UW – Madison Arboretum helped us learn how to test for the OE parasite. We also looked for a new sponsor better suited to ensure the long-term success of Monarchs for Kids. The project is very labor and resource intensive and we are thrilled to have found it with the Madison Children’s Museum! immense amount of time in the program; it has quickly grown in popularity over the years. This year alone, with the help of many volunteers, he provided eggs to 144 classrooms at 33 schools (this is including schools outside of Monarchs for Kids’ partnership with Friends of Lake Wingra). None of this would have happened without him. • Attract and retain board members. • Reflect the demographics of our watershed in our board members. • Increase financial health to provide more hands-on projects. • Craft applicable messages to different audiences. • Expand our network based on diversity (location, race, gender, age, etc. ), professions (e.g., teacher, business), or enthusiasts (e.g., runners, paddlers, fisher people). • Promote an active watershed by enhancing volunteer opportunities. • Define one area to focus on. • Identify partners to help implement the plan. • Define measurable criteria for success. THANK YOU to all of our monarch volunteers this year!